Disneyland is The Happiest Place on Earth. Walt Disney World is The Vacation Kingdom. Both have been making dreams come true for literally decades! So what could possibly ruin your Disney Experience? OK, this isn’t something you could do to yourself, unless you’ve perfected a rain dance. But attending a Park only to have the heavens open up in an attempt to drown you doesn’t usually make for an ideal day! But this is only at number five because there are lots of things to do during a cloud burst. Take in one of the longer inside shows. Shop. Eat. Or just take a break back at the Resort. The one good thing about Florida is that if you don’t like the weather, wait a minute and it will change! And California is usually pretty sunny, so rain should be the least of your worries. If you want to ruin your day at a Park in record time just put on your running shoes and try to break the land speed records to each ride. While you’re at it, you may as well trample some little children and knock over an older person, just to round out the experience. Sarcasm? Yup. SLOW DOWN! Space Mountain has been blasting visitors into the darkness for decades and it will still be doing so when you arrive. Whether your arrival time is now, later, or tomorrow! Over or under, either one can ruin your Park experience. Too much planning takes all of the spontaneity out of your day, and too little can find you standing in the Hub wondering which way to go and what to do next! So plan enough to know where things are, when special events and shows start, and what the average wait times are for the attractions you just have to visit. But think carefully before you FastPass yourself into a straightjacket and book every meal months in advance! Things have a way of popping up and sometimes you just don’t want to eat that burger at exactly 11:34 am. Leave yourself some wiggle room! Sardines. Buffalo herds. Lemmings. What do they all have in common? They travel together. Way too close together, while smelling less than pleasant! Visiting a Disney Park at peak times is a great way to see the back of thousands of heads as you are pressed between a wave of humanity while simultaneously learning if the woman to your left really has an all-day antiperspirant. She doesn’t. And yes, that is the wheel of a stroller being jammed into your ankle. Do yourself a favor and NEVER visit a Disney Park at peak times! By now you’ve probably figured out that I have one. But I’m pretty sure if you visited a Park in peak season, with no plan in place, and started to rush to your favorite attraction, only to have the skies open up and soak you before you got ten steps forward… you’d have an attitude too! And just like the character Anger in Pixar’s new movie Inside Out, it can be fun to have a bad attitude sometimes! But not at a Disney Park. No matter what happens, try to keep a positive attitude. How you ask? Remember that being at a Disney Park is better than being almost anywhere else! Think about it: You could be visiting the Dentist. Or at work. Sweating in a gym. Standing in line at the supermarket in the 5-items-or-less line with 10 people ahead of you with 50 items each. Need I go on? Attitude people. Get yourself a good one! So there you have it. My picks for the top 5 ways to throw a wet blanket on your Disney Experience. But seriously, don’t use them. Today’s topic is about our online planning resources. 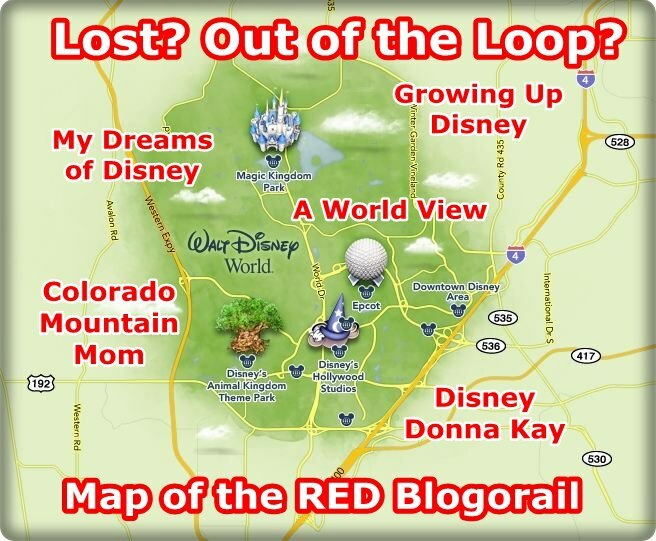 Other than our own sites or those of the Magical Blogorail Red line, what are some of our favorite social media or other online planning resources for planning our Disney vacations? You know, it’s kind of funny to me, when I really sat down and started thinking about my online planning resources, it was kind of hard to come up with a concrete list. I have a TON of Disney sites I read — including my teammates here on the Red line — but generally speaking, I’m reading their sites more for their trip reports, incredible pictures, and unique stories that they tell us than I am for planning tips. In fact, and I’m sure that I’m being short-sighted in my trip planning — but I can probably narrow my online planning resources down to three sites — or less! Detailed information on the resorts, the parks, and the dining options. Incredible customized maps that you can have printed on special paper and mailed to your house — and they are free! The park schedules for knowing when they are open and when they close, and what time some of the shows are going on. The new My Disney Experience section — which, while it is still quite buggy and full of hiccups, will get better in time. I recently started using the Touring Plans website to create customized touring plans for my clients. This is one of the free services that I provide for my clients. It is a useful tool in helping you see as many attractions as possible while spending as little time as possible in lines. As a site goes, it feels a little wonky to navigate, but it is stocked with many touring plans that you can customize for you and your family, and there are plans for all situations, all times of the year, and more, so I highly recommend you check them out if you are interested! There really aren’t a whole lot of podcasts that I listen too — but one that I really do listen to, in many cases just for the sheer entertainment I get out of it — is the MouseChat.net Podcast. I listened to it before I started my endeavors as a travel agent, and I listen to it now as well. The gang of Chris, Steve, Lisa, Lauren, and Bob never fail to make me smile and crack me up when I listen to them! That about wraps it up for me — not that many things to research, right? But somehow, we seem to be doing okay none-the-less! So you decided to visit Disney World, you’ve read the guide books and maybe even contacted a Disney World vacation planning specialist (like Mike here on this blog, using a Disney planner doesn’t cost you anything and often will save you time and stress during your planning process; if you haven’t reserved your vacation details, you really should reach out to Mike). However, I think that in order to envision the whole vacation, the Walt Disney World vacation planning DVD is one of the best tools available to you. The DVD brings life to the ride descriptions in a way a guide book never could. I have been to Disney World 17 times and yet I order a vacation planning DVD every year. I love seeing everything that’s new at Disney World since my last visit. It also helps excite me for the upcoming visit (and is a great way to show younger kids some of the things to expect to see and do on your next vacation). The DVD is broken up by theme park but it also covers the hotels, water parks, restaurants and other recreational activities. The basic feel of the DVD is fairly consistent year to year but how the information is presented usually changes regularly. For example, recently there were 4 people on the DVD. There was a mother that addressed the best Disney experiences for families, there was the “thrill seeker” who covered the thrill rides at Disney World, there was the “calm and relaxed” guy who shows you have best to rest and relax on your vacation and there was the general tips woman (she was also the host of the DVD) who covered anything else. The DVD comes with written information as well which is a valuable planning tool as you can refer back to it. As everyone is different, it’s a good idea to have at least a basic understanding of what you want to see and do at Disney World as you go through the vacation planning process. Even the best vacation planner will be able to better assist you if you have an idea of the type of things you wish to see and do during your trip. So, make sure you get your copy of the Disney World planning DVD and help planning!